Goodreads Summary- A contemporary novel about three adopted siblings who find each other at just the right moment. Characters- This book is full of complex but likable and relatable characters. I really connected and was invested in the three siblings, but the side characters even stood out to me- especially Joaquin’s foster dad Mark, Grace’s friend Rafe, and Maya’s sister! Far From the Tree is most definitely a character driven story and these characters truly shine. It was a joy to get to know them and watch them grow and change over the course of the novel. Familial Relationships- If you have read any of my past reviews then you might have noticed that I love reading about family dynamics! I much prefer reading about the relationships between family members vs. romantic relationships. There is some romance in this novel, which I truly enjoyed reading about, but the main focus is on siblings as well as the complicated relationships between parents and children. These families are some of the most realistic that I have ever read about in not only YA but in fiction in general. Far From the Tree shines a light on the fact that there is no perfect family and that families comes in all forms. Important Issues- Far From a Tree tackles so many important issues and handles them respectfully. It addresses adoption, teen pregnancy, alcoholism, race, violence,etc. This book is also very diverse. I was so impressed with the messages that this book sends. Far From the Tree is one of those books that, despite dealing with heavy subjects manner, still manages to be light and put a smile on your face. I am sitting here scratching my head trying to come up with something that I did not like about Far From the Tree and I can not come up with a single thing! I do not give star ratings on my blog but if I did this would for sure be a 5 STAR book! 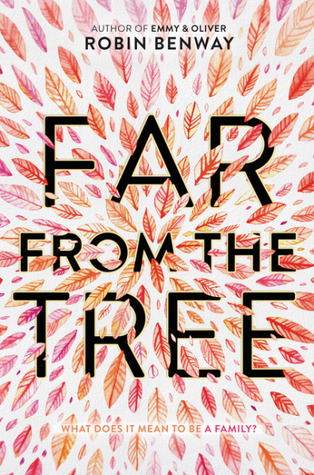 Far From the Tree was a book that took me completely by surprise. I was in no way expecting to fall in love with this book in the way that I did. It will forever be a book that I recommend that everyone should read. I can not wait to read more of Robin Benway’s work! If you read Far From the Tree I would love to know your thoughts! This book looks wonderful! It’s added to my TBR, and I hope I can pick it up soon. Thanks for the great review! That makes me happy to hear! It is such a fantastic book. I hope you love it! Love this “quick review” style 🙂 So far I’ve been hearing great things about this book, and now I definitely want to read it! Thanks for sharing! Thank you! It is truly amazing! AHHH. I’m just so happy to hear that you’ve read this book and enjoyed it so much. I feel like it’s wildly underrated and it should be on everyone’s TBR. I’m a big fan of the family vibes in books as well, and this one had plenty to give me all the feels. I love the brother/sisters relationship as well, as they got to know each other, I just wanted to hug them so badly about 99% of the time. Thank you! I haven’t seen to many people talking about it either! I wanted to give them all a hug as well. I loved how their relationship develop. Was so charming to read! I have been SO interested in this book! I heard it is great for fans of the tv show “This is Us”. So glad to see you loved it! I will have to check it out. It is definitely perfect if you love This Is Us. Same feels! The cover is stunning and thankfully so is the story inside! This is a book that I think I may want to read, but I know I’ll have to wait until I’m in the mood to read it first. Thank you! So happy you loved it too!